They say that Rugby is the sport that they play in heaven. For the majority of Rugby-playing nations, heaven is the concept of a sport that is no longer dominated by the mighty All Blacks. The famous team from New Zealand has been completely superior to all that have opposed them during the 21st century, and some of the records they hold are absolutely emphatic. The World Cup is the sport's biggest prize and the 2019 edition will present New Zealand with the opportunity to collect three consecutive titles (and four overall). However there are many nations building towards a successful campaign, not least of all Japan who will become the first Asian nation to host the event. So who will win the 2019 Rugby World Cup? It is no surprise to see New Zealand as a heavy favourite to win the tournament, although realistically any of the world's top eight nations are in with a decent chance. Below is a table that outlines the current betting options. With over two years until the tournament gets underway, there is little doubt as to who is the greatest team. The All Blacks have sat atop the world rankings since the start of 2010 and don't seem to be showing any signs that they are slowing down. They have depth in every position across the park and have the strongest domestic clubs out of any of the competing countries. The Kiwis have almost been invincible of late. In the Rugby Championship (contested since 2012 alongside Australia, South Africa and Argentina) the All Blacks have played in 27 matches and only lost twice, picking up four out of a possible five titles in that time. The side has also been undefeated at the World Cup since the quarter-finals in 2007; they have won fourteen consecutive matches since they lost to hosts France. New Zealand's odds are ridiculously low considering the amount of Rugby that is still to play over the next two seasons, and therefore it is definitely not advisable to consider placing a wager just yet. In saying that, if the dominance of the All Blacks continues, there is a possibility that this will be the best price you'll receive as they continue to shorten. According to the World Rugby Rankings, England (+432) are currently the second-best team in the world, which is a remarkable turnaround considering they were ranked eighth as recently as January 2016. This shows how competitive international rugby is at present (if you take out the All Blacks of course). Their rise in the rankings can be attributed to their 2016 and 2017 Six Nations victories. England also have historically been very inconsistent, and their showing at the 2015 World Cup is probably the best proof. In a tournament that they hosted, England failed to make it out of a group that featured eventual finalists Australia and neighbours Wales, who would both qualify to the quarter-finals at their expense. It is much too early to determine whether England will be in 2015-form or 2017-form by the time the 2019 World Cup comes around, and at their current price it would be advisable to steer well clear given that they will likely provide better odds at some stage prior to the tournament. Australia (+800) appear in fourth place on the odds table, which is also indicative of their current world ranking. Known as the Wallabies, the Australians are second only to the All Blacks in terms of successful World Cup campaigns - they have won two trophies and made it to four finals, and are one of only three teams to have made the quarter finals in all eight tournaments. While Australia's ranking of fourth is not their lowest in the years since the rating system was first introduced (2003), they are undoubtedly in a form slump having lost four of their ten international matches in 2016/17 (not including their 3-3 record in the 2016 Rugby Championship). Lacklustre performances by Australia's Super Rugby teams in 2017 are a major issue for National selectors, who will be hoping for a bit more depth by the time 2019 rolls around. Regardless of their ranking though, the Australians are always a chance when the World Cup is on offer. The side was heavily written off leading up to the 2015 edition yet managed to knock out host nation England and win six from six before running into the All Blacks in the final. At their current price, it's not a bad idea to have a punt on Australia who are unlikely to rise much higher before the tournament begins. The last team worth a mention on the list of contenders is South Africa (+679), who are the only side since 2004 to have wrestled the number one ranking away from the All Blacks. The Springboks have also won two World Cups, winning in 1995 and 2007, and finished a very respectable third in 2015 after facing New Zealand in the semi-final. South Africa's current ranking of fifth in the world does not really do the side justice, and they will be certainly one to look out for when the tournament kicks off. 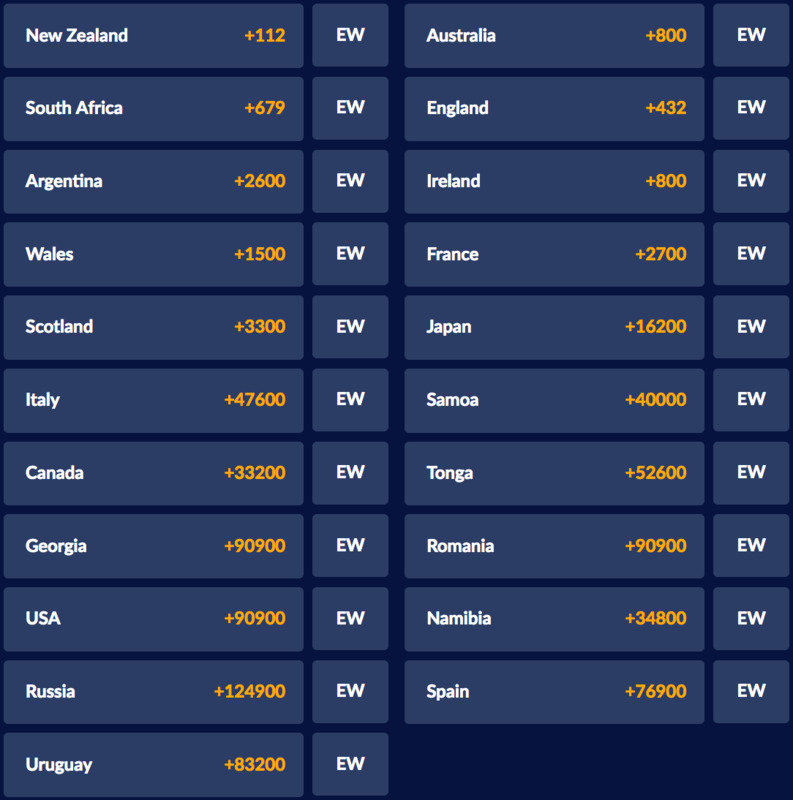 Odds of +679 are still generous for a nation with such a great pedigree in the sport, so if you think they are as good a chance as anyone to win the tournament, now is the best time to jump on. Ireland are currently ranked third in the world and appear on the list of odds at +800, a price that appears to be well short of their actual chances at the 2019 World Cup. While Ireland have certainly closed the gap on heavyweights England, South Africa and Australia over the last ten years, they are yet to progress past the quarter-final stage of a World Cup tournament, and it is hard to see them doing so in 2019. France (+2700) often punch above their weight in World Cup tournaments, having finished as runners-up on three occasions and never once failing to make it out of the pool stage. They are currently ranked a lowly eighth below Scotland and Wales, however they are a good bet to reach the semi-finals. It is a bit of a stretch to see them winning the tournament. Speaking of teams punching above their weight, Wales are a also a team on the rise. In spite of their ranking falling to sixth recently, if you were to graph their rating since 2003 you would see a slow but steady incline. Again, it is tough to see the Welsh team raising the trophy, but they would be a good bet for a semi-final berth, especially considering that aside from Australia, they have little competition in Pool D.
Scotland (+3300) deserve a mention on the back of an impressive couple of years. The side was ranked as low as twelfth just two years ago and rose to an impressive fifth in May 2017. It will be a very big ask for the Scots to progress further than the quarter-finals, however if they can build on their current form then there's always a chance! This will be the first time a Rugby World Cup will be played away from a traditional Rugby playing nation, and as such hosts Japan do not appear among the favourites. But you can ask a South African fan just how dangerous this team can be - who could forget the famous upset win by the Red and Whites over the Springboks in their opening pool match in 2015? Buoyed on by home support, and with Ireland and Scotland the only seeded teams alongside them in Pool A, this team has a very good chance of making the quarter-finals, and this is where you should look to place a bet. Whatever your pick, you can be sure to find the best odds available right here. Do you agree with our review? Who do you think will win the 2019 Rugby World Cup? Join in the conversation on Facebook and send your thoughts!